Sometimes we can find treasures on our doorstep. An area of land kept mown to keep a farmyard tidy has blossomed after a few weeks without cutting. Earlier in the spring this piece of land had shone golden with dandelions and within a few weeks their seeds were providing a feast for finches and linnets. In the last few days, hiding amongst the grass and clover, were some newcomers . 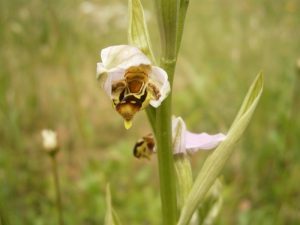 Two pyramidal orchids, five bee orchids and three broomrape plants, the latter feeding on the roots of the hawksbeard. It is a reminder of how rich this country’s plantlife must have once been and how long the seeds stay dormant in the soil, waiting for the right combination of weather and management. How many wildflowers would bloom if we put away our mowers and strimmers and left the nitrogen fertiliser on the shelf? Some years ago I was judging a farm conservation competition in Somerset. On this particular farm, the eventual winner, the family were keen to improve wildlife and had made particular efforts tree planting and providing habitat for farmland birds. Walking along the hedge and track beside one of their arable fields, I asked why a short stretch was full of wild flowers. We were all mystified by this sudden display of colour and diversity. Then I noticed that on the other side of the grass track was a bank of earth which had protected the hedge and verge from any drifting of fertiliser and herbicide applications to the adjoining field. An example of how vulnerable our wild flowers are. Back at home, on a patch of unused land, kept tidy for farm vehicles, is a small remnant of our wild flower heritage. It has been a good year for wild flowers. 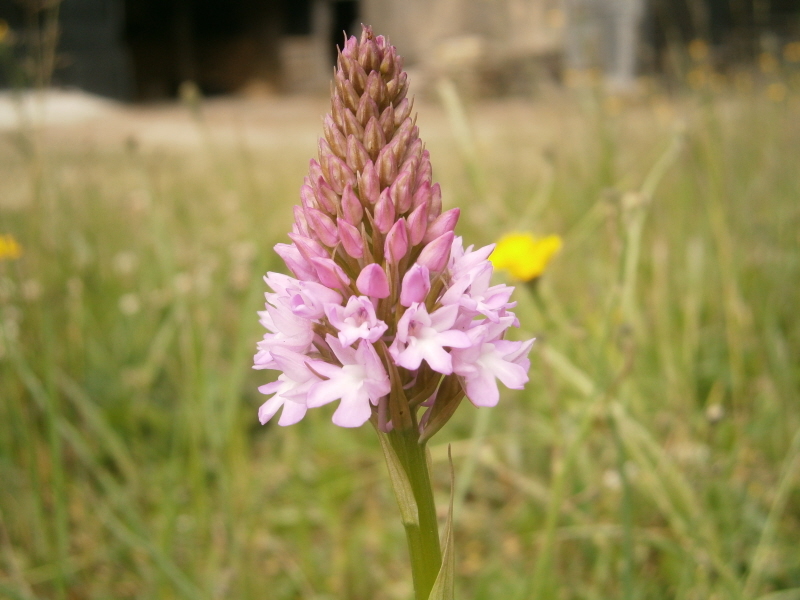 From the early primroses and cowslips, to violets, greater stitchwort, speedwells, red campion and now the orchids, the farm has yielded a few treasures. We have such a rich heritage of plants which in turn support numerous insects and birds. Sometimes we have to get down to ground level to marvel at the designs, the colour, the change from flower to seed and the links between plants. 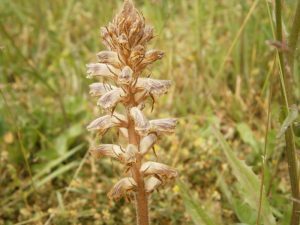 Who would have thought the common old hawksbeard would have given life to the saprophytic broomrape feeding on its roots. Getting up close we can wonder at the amazing bee like flowers of this orchid. It is time to get reacquainted with the smaller things in life and to leave a few unmown corners to yield treasures that have been hiding, just waiting for the right moment.